I just got back from New York about 2 hours ago. Can you believe I've never been to an H & M store. I call it the curse of the H & M. When I've gone to New York in the past or to San Francisco (where they also have an H & M) I've told myself I need to go, but something always ends up happening and I can't make it. 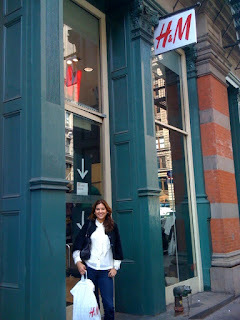 Well the curse was finally broken today and here is a picture of my first experience with H & M =) Although I wish I could have made it for the Matthew Williamson launch, I still found a couple of pieces. I ended up buying these cute navy blue wedges (although my friend thinks their black) for $16 and a pair of black skinny jeans on sale for $19. Great work, Carmen! Keep on your viva fashion blog.